Summer Portrait Of A Merry Child. Smiling Girl With Long Brown Hair Dressed In A Crown Of Dandelions Flowers. Pre-teen Girl Lies On The Green Grass On The Lawn Among The Dandelions And Laughs. Lizenzfreie Fotos, Bilder Und Stock Fotografie. Image 100479314. Standard-Bild - Summer portrait of a merry child. 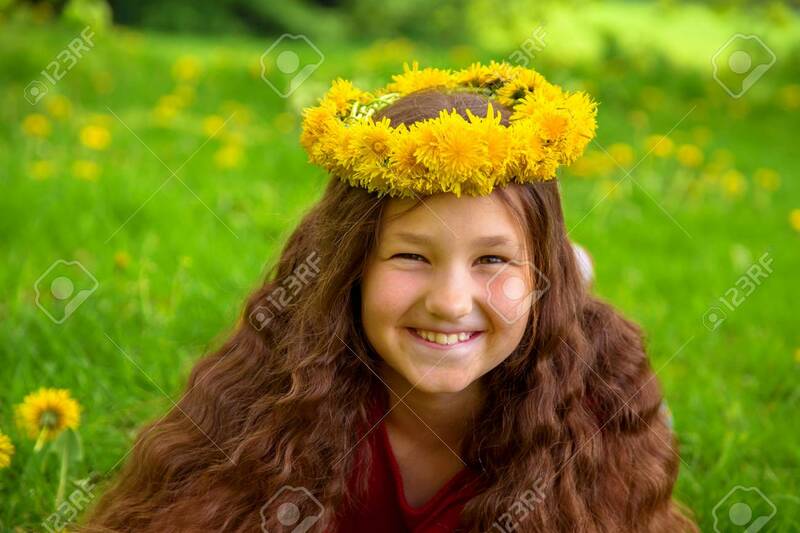 Smiling girl with long brown hair dressed in a crown of dandelions flowers. Pre-teen girl lies on the green grass on the lawn among the dandelions and laughs. Summer portrait of a merry child. Smiling girl with long brown hair dressed in a crown of dandelions flowers. Pre-teen girl lies on the green grass on the lawn among the dandelions and laughs.